Astute observers will notice that there are now two links in the menu bar that reference something called Fre-MOn30 — a mail list at Yahoo!Groups and a web site. Fre-MOn30 is an outgrowth of several initiatives for an On30 Module Standard, including OCMODS. The unique thing about the Fre-MOn30 is that it provides a standardized way to build non-standard modules. In other words, generally speaking, the standard is more about the module interface than anything else (although certain stipulations are placed on the mainline, to provide allow for the greatest compatibility with the widest array of locos and rolling stock). The Mid-Atlantic modules are compatible with Fre-MOn30, at least at the interface level. One of the more inspirational sites on the web, at least as far as I’m concerned, is Laurie Green’s, especially his waterfront scenes. Of special note is “Bob’s Boat & Bait Shop.” You may (or may not) recognize the structure from my mockup photos. Although based on the same design and concept, mine will, of course, be a bit different. 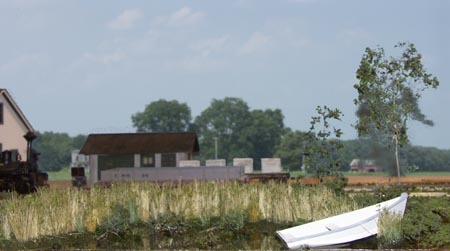 Materials and construction details will be altered to more resemble similar buildings on the Eastern Shore of Maryland. I’ve found the best way to program a DCC decoder, and it’s free (depending upon your DCC system)! DecoderPro is a free application that runs on pretty much any WindowsXP, Windows7, MacOS or Linux computer (OS list updated 12/31/12 to include Windows7 and delete Windows98). If you have an NCE Powerhouse Pro system of just about any vintage, you can simply plug your computer into the serial port and you’re ready to program just about any decoder currently on the market. Other systems will require some sort of computer interface (for Digitrax users, that’s the MS100). Decoder settings, including those pesky custom speed curve tables, can be easily adjusted and sent to the loco, along with literally every other setting in the decoder, and all through easy to read and understand screens. Once you’ve got all your settings for a particular loco set, you can save it off for future reference, or, if you’ve got a “fleet” of one particular loco type, simply change the address and download all the same parameters to each loco. Did I mention this is free software? What more could you ask for? Just for fun this morning, I composited yesterdayâ€™s progress picture with a shot I took on the Eastern Shore a couple of years ago â€” just to get an idea. We went away for a couple of days, which kept me from messing with things I shouldnâ€™t mess with. The result is that the new â€œwaterâ€? poured into the swamp area has set up nicely, although itâ€™s still rubbery. Clever Models designs and produces high-quality structure kits and texture sheets — made from paper. The textures and designs come from a CGI artist and, presumably, modeler in the motion picture industry. He’s learned to apply the effects we see in movies to 3-dimensional models, which are sold at very reasonably prices. From the pictures on the web site, I’d say they look fabulous. As I mentioned last week, I had a lot of work to do to get ready for some Orchard Studios shows. Saturday, we had our first show of the season, and Sunday, I played! First, the area in and around the marsh was re-sceniced. I decided that the thing to do was to simply go over the bad. So, I scuffed up the surface of the old â€œwaterâ€? and painted it a yucky brownish color. I then re-applied the bottom texture. I then turned my attention to the area a little further east of the marsh. One thing I remember growing up was that there were huge, huge piles of oyster shells all around near the waterfront. I chose to model this near the end of the switchback spur, and Iâ€™ll add a portable conveyer for loading oyster shells into gons when I come through and detail the area. There also needed to be a way to access the area by car or truck, for the folks working the docks, so this grade crossing and gravel roadway was started. The road will be taking a sharp turn to the left, to avoid another wetlands area, and to connect with the town. The grade crossing itself is made from Kappler S-scale contour ties, as I have a large quantity of them on hand. Campbell HO switch ties would work equally well. The coloring here is simply a stain of Woodland Scenics Raw Umber. This morning, I got â€œbraveâ€? and poured the new water. I was going to wait until tonight, but everything seemed plenty dry this morning. I did not use the Woodland Scenics Realistic Water again. This time, I used a product that is identical to Envirotex Lite, but is a little less expensive. Iâ€™ve used the product before, with great success. I found it at Wal-Mart in the flower-arranging section, and itâ€™s called â€œLe Silk Shoppe Acrylic Water Kit.â€? Each box contains a total of 8oz. of material, which looks like it will be just the right amount to complete this area. Although the material takes 24-48 hours to completely hardem, Iâ€™ve found that subsequent pours can be made much sooner, and Iâ€™ll likely make the second layer either this evening, or tomorrow morning. The final results of my previous use of this material can be found here. The page was made while I was still modeling in HO, and a member of the FCSME. Once the water has completely hardened, Iâ€™ll make ripples in the surface using a stiff brush, and gloss medium from Mod Podge (available at the local craft store). Hereâ€™s a parting shot for the day. Shay #8 has just brought a gon in to take away some of those oyster shells, and a flat is ready to be shoved onto the pier for unloading. The conductorâ€™s waiting in the caboose on the siding â€” no reason for him to set down his coffee cup! Even with the sound systems installed, it’s going to be a little quiet around here for a few days. I’ve got to scurry around and get ready for a art show this weekend, so there won’t be much time to play with trains — a serious bummer! Don’t worry, though. I’ll be back, ASAP!